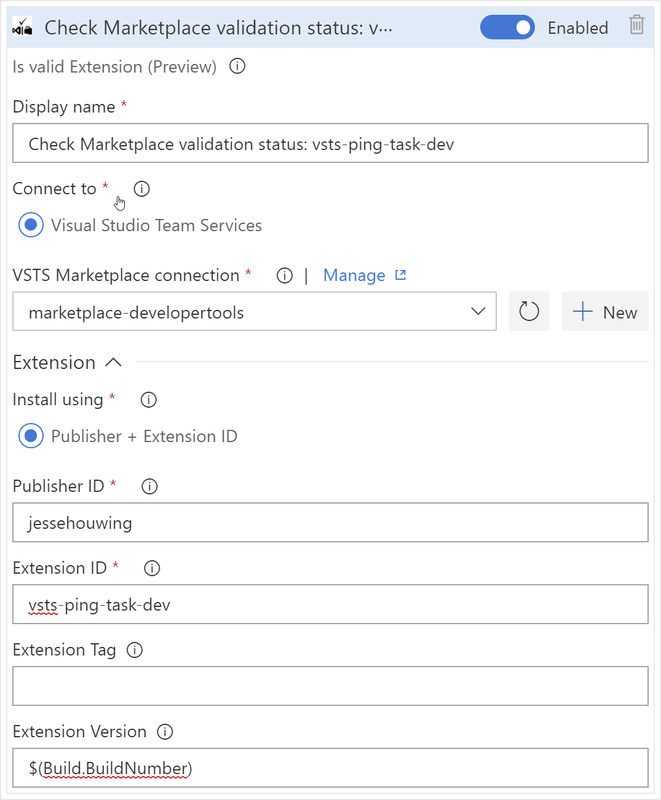 A recent addition to VSTS is the ability to run a quick check prior to triggering a release to an environment. These checks can be used to check that there are no new customer complaints, no mad users on twitter, no important jobs running in the environment etc. I wanted to make use of this feature as part of the CI/CD Tasks for Extensions. With the recent introduction of validation of the extension, it's possible that your newly uploaded extension isn't immediately available. So before kicking off tests for your extension, you may want to wait for the validation to succeed. 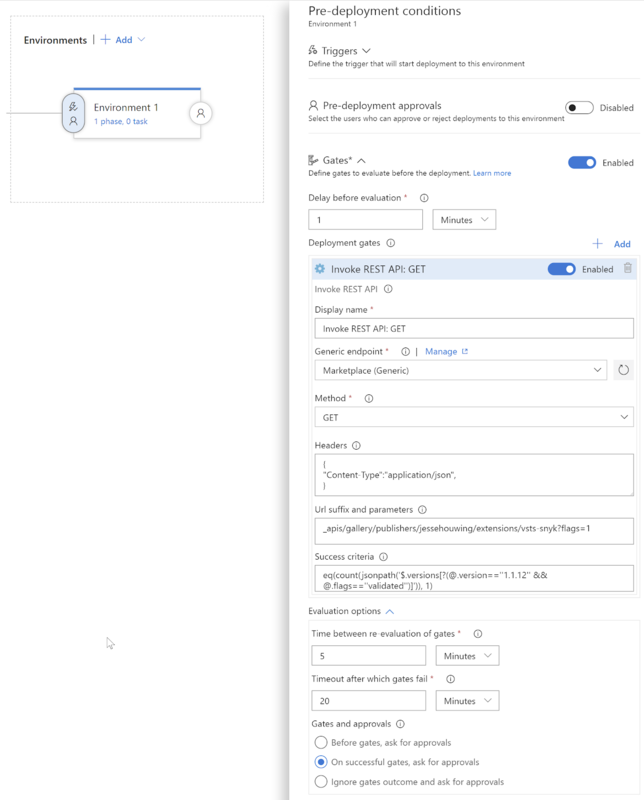 This resulted in two tasks, the first is a Server Gate task that can wait for the extension validation to finish before triggering a release. The second does the same thing, but runs on the build agent. They both rely on the Marketplace REST API. If the API call requires authentication, you can supply these through a basic credential. Once you've configured your gate you can test it by triggering a release. It took me a while to get the expression right and after triggering 8 releases I'd reached a critical frustration level. 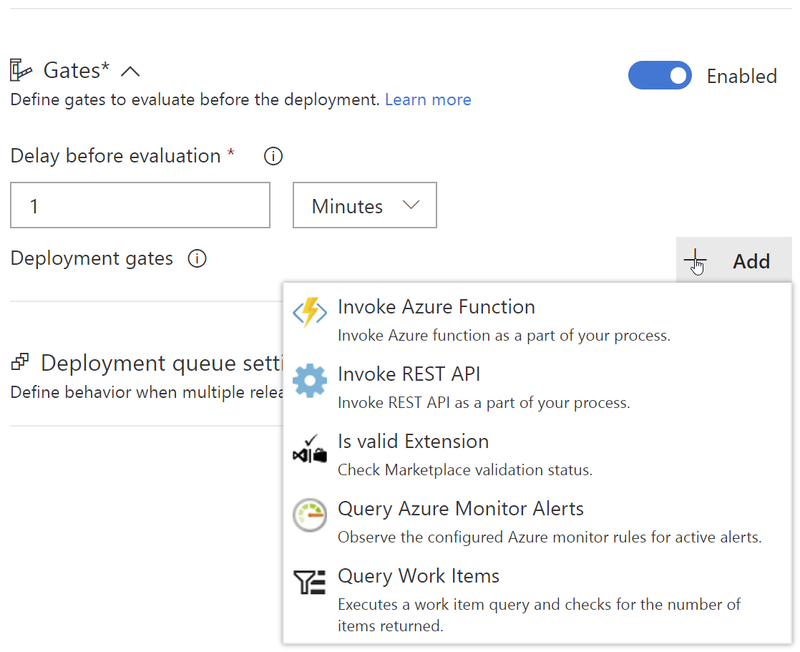 Before using the Invoke REST API release gate I had been testing my expressions through publishing an extension and that ook even longer. I decided to build a small tool to quickly test the release conditions locally, without having to queue a build. As you can see, the expression tester allows you to test an expression and provides direct feedback. I've added support for simple Build and Release variables as well, they're automatically detected when you type the expression. With this little tool, your time to create and validate complex expressions will drop from multiple minutes per iteration to multiple iterations per minute. The expression parser used by the server tries to do a couple of clever things and short-circuits the validation of expressions. This caused me to detect issues in the second jsonpath only after triggering the second condition ($(extensionVersion) = 'latest'). 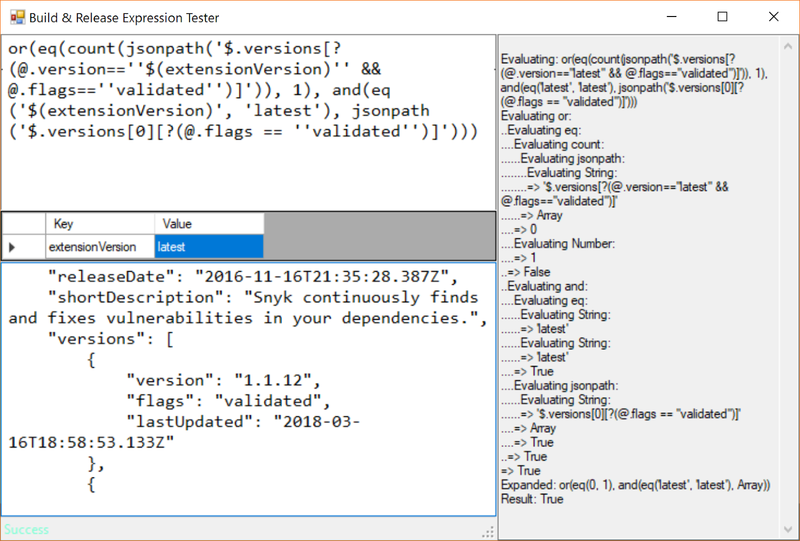 "Expression": "or(eq(count(jsonpath('$.versions[? (@.version==''$(extensionVersion)'' && @.flags==''validated'')]')), 1), and(in('$(extensionVersion)', 'latest', ''), eq(jsonpath('$.versions.flags'), 'validated')))"
If you've configured your BuildNumber to be just the version you want to publish (default for my pipelines) and made the extension your primary artefact, then you can pass in the $(Build.BuildNumber) variable to wait for that specific version. The tool I created to test the expression is available as a download on GitHub. The tool requires a local installation of Team Foundation Server 2018 Update 2 (due to the fact that I can't distribute the server binaries). The server doesn't need to be running, so you can skip the configure phase after installation, plus it won't use any resources. Even an expired trial version will do. Do you have specific types of gates in mind for your pipelines? How would you like the release gate feature to be improved? Leave a comment below, I'd love to hear. Picture used under Creative Commons.